Braised Potatoes and Carrots, from Thyme for Cooking, easy sides. 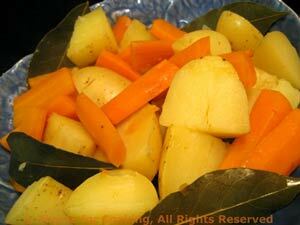 The potatoes and carrots are cooked together in stock with bay leaves. They will absorb most of the stock, giving them a deep flavor and light glaze. Put everything into a saucepan and bring to a boil. Cook, uncovered, until vegetables are done and chicken stock has been absorbed. If there is any stock left, pour it off or use it in elsewhere.